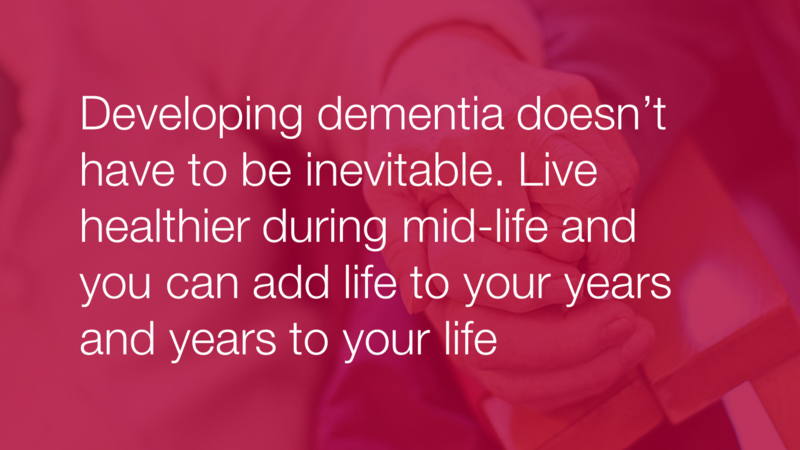 This week is Dementia Awareness Week; a welcome opportunity for us at PHE to share what we know about dementia, that it affects over 800,000 people in the UK, and to highlight what we can all do as individuals to reduce the risk of developing dementia in later life. Dementia is a global burden. In the UK 835,000 people live with dementia and worldwide the figure totals 47.5 million. By 2040, if current projections continue, the number of people affected is expected to double. It’s also estimated that dementia costs the UK economy over £26 billion per year. But it is not an inevitable part of ageing. We know that people are more likely to live well in their older years if they live healthily in earlier life, particularly during mid-life. There are some simple actions we can take that fit into and complement our everyday routines to help reduce the risk of getting dementia, in particular vascular dementia. The sooner we start the better. Even after diagnosis of dementia, addressing risk factors can also help to reduce the progression and severity of the disease. For instance, what most of us recognise as actions to improve heart health, such as not smoking and being physically active, also contribute to maintaining a healthy brain. Stopping smoking, physical activity and reducing alcohol intake will help, but so too will being involved in our communities to avoid lack of interaction and loneliness, which is also a potential contributing factor. People have a real opportunity to manage their health better by attending the NHS Health Check. This allows us to identify issues that could lead to or enhance the risk of dementia, like blood pressure problems or an irregular heartbeat. In particular the risks are heightened for people with diabetes or pre diabetes, so ensuring they take advantage of these free health checks is significant. Despite advances being made, research for dementia remains a challenge and still lags behind other major non-communicable diseases like cancer or heart disease. Understanding the various predisposing factors is difficult as in many cases dementia has more than one predisposing cause. So what is PHE doing about it? We are committed to tackling dementia, not just in this country but on a global scale as part of the Global Dementia Framework – a global collaboration to raise awareness of the socio-economic burden that dementia brings, and to highlight the impact that working together can have. We will build on the successful Blackfriars Consensus by continuing to develop the evidence base on risk reduction and translation of evidence into practice. We will continue to raise awareness of actions people can take to reduce their risk of dementia, and highlight the effectiveness of the NHS Health Check. We are committed to supporting the Alzheimer’s Society and other key stakeholders in the creation of more Dementia Friendly Communities and we will continue to support the campaign. We will develop a collaborative approach to risk reduction with the Devolved Nations, sharing good practice and learning from research. As we move into this year’s Dementia Awareness Week one of our key aims at PHE is to encourage individuals to take action. There are things we can all do to improve our health and wellbeing and reduce our individual risk. But it’s about acting now. It’s about adding life to your years as well as years to your life. Thanks for a great blog and the information on dementia and PHE's actions. It is clearly a focus going forward and a number of areas, linked together in a consistent way, can help the person, and their carer (paid and unpaid).. It is about quality of life and also understand and responding to the need, in a timely manner. Thanks again for the blog Charles.